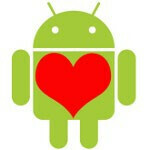 Valentine’s Day is all about the Mobile World Congress in Barcelona... wait, what? Okay, true for geeky humanoids (us included), but luckily not so for the rest of the human population. But being human isn't easy, especially when feelings get involved, and that's where you might need an extra brain to help you keep your significant other in that sweet dreamy state of emotional attachment. Love that is. 1800flowers Mobile Gift Center – for the flowers. Qik Video Camera – to record and share videos of fluffy animals. In the Kitchen: Recipes, Chefs – only if you are ready to put on an apron and perform culinary wonders. Finally, TripAdvisor or KAYAK Flight and Hotel Search will let you get away from all the loving people and enjoy tropical beaches on your own. As nice as apps are, a gadgety gift might be the right decision, so don't forget to check out our Valentine's Day Gift Guide 2011 for our hand picked selection of phones. Do you have any better suggestions? Let us know in the comments!